This is an excerpt from Running Science by Owen Anderson. Examining the history of mile and 1,500-meter training is useful to modern runners and coaches because it helps provide an understanding of why mile or 1,500 meter performances have improved so dramatically over the years. Further, it forces us to re-examine our overall philosophy of mile training and also offers some great traditional workouts that still work very well in a current runner’s overall training plan. Mile training has an especially interesting history. One of the first great British milers, Walter George, worked in a chemist’s shop each day from 7:00 a.m. until 9:00 p.m. and thus had limited time available for training. Rarely able to run outdoors, George developed a system of indoor training in which he ran in place with high knee lifts and a springing action. Despite carrying out most of his workouts in a small room at the chemist’s establishment and racing on tracks that resembled plowed fields, George required just 3 minutes and 10 seconds to surge to an impressive victory over archrival Lon Myers in a three-quarter-mile grudge match that was witnessed by 60,000 screaming fans in 1882. Apparently, the stationary running did not optimize postrace recovery since George lapsed into unconsciousness for 20 minutes following the race; Myers ran a respectable 3:13 and remained even longer in the comatose state—almost 2 hours, according to credible reports. George’s best effort came in 1885 when he sizzled through a mile in 4:10.2, a time which was not bettered anywhere in the world for almost 50 years. Paavo Nurmi, the incredible Finnish runner of the 1920s, took a slightly different approach to the establishment of a world mark: He trained outdoors, combining both high-volume and high-intensity training. Nurmi was an incredibly strong runner: As a young, impoverished errand boy in Turku, he had pulled heavily loaded carts up and down steep hills. He prepared for his 1,500-meter world record, established in 1924, with a training schedule that each morning included a 12-kilometer (7.46 mi) walk, four or five hard sprints on the track, a high-intensity 400- to 1,000-meter (.62 mi) run for time and then a 3K to 4K run (1.86-2.49 mi) with a very fast last lap. Each evening, Nurmi bolted 4,000 to 7,000 meters (2.49-4.35 mi) across the hilly countryside, punishing himself at the end of each effort by running at close to maximal speed. His training day ended with four to five lightning-quick sprints. Three weeks before the Paris Olympics in 1924, Nurmi set a 1,500-meter world record of 3:52.6 but was angry at himself for not running at least 2 seconds faster. Forty minutes later on the same evening, Nurmi rolled through 3 miles (4.83 km) in 14:02 and 5K in 14:28.2, both world bests at the time. The amazing Finn had broken three world records in one evening of running! Swedish runners dominated the world of distance running in the late 1930s and early 1940s, and a Swedish runner named Gunder Hägg became the best competitor in the world at both the mile and 1,500 meters. He employed a new form of training that has retained its popularity even today. Instead of running at a relatively even velocity, Hägg constantly varied his training pace, alternating blasts of speedy running with easy coasting along the forest trails of central Sweden. Coached by the inventor of fartlek training, Gosta Holmer, Hägg also scrambled up hills at full speed, running easily on the descents. During the day, Hägg worked as a tree trimmer, but he usually found time to fartlek his way through two daily 5K rambles, each requiring about 20 total minutes. 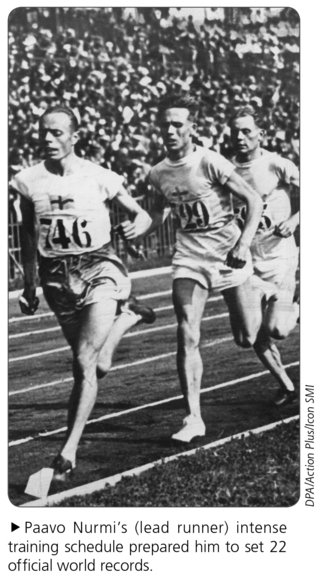 The steady diet of fartlek running permitted Hägg to enhance his natural speed and economize his running form, so much so that the Swede blazed his way to 10 new world records over seven distances (the mile, 2 miles, 3 miles, 2K, 3K, 4K, and 5K) during 1942 alone, one of the most amazing competitive-running accomplishments of all time. The world records included a 4:04.6 mile and a 3:45.8 clocking for 1,500 meters. Hägg’s success meant that fartlek training had arrived as a performance-enhancing workout for middle-distance competitions. In between the eras of Hägg and Elliott, another form of training arrived: the hard-repeat workouts favored by famed Hungarian runner Emil Zatopek. This kind of speed-building interval training was adopted by the British miler Roger Bannister, who used it to finish fourth in the 1,500-meter competition at the 1952 Olympics in Helsinki in spite of a low-volume training schedule. A typical Bannister workout would not look out of place in any modern miler’s log book: Sir Roger liked to run 10 quarter-mile (.4 km) intervals per workout at close to race pace, with about 2 minutes of recovery between each interval. Early in 1954, Bannister was running each quarter in about 61 seconds, a pace that left him very disappointed. He knew that he would have to figure out some way to get a little faster if he wanted to break through the coveted 4-minute-mile barrier. Frustrated by his inability to improve, Bannister took a complete 3-day respite from running. When he returned to the track after this furlough, he found that he was suddenly able to run the same 10 quarters in 59 seconds each. Thus, the two cornerstones of Bannister’s training had been put in place: (1) 400-meter interval training at close to race speed and (2) periodic total rests to produce freshness, improve speed, and permit the body to adapt and recover. These two principles, race-specific training and enhancement of recovery, remain relevant today. On May 6, 1954, after a complete 5-day break from running, Bannister spent his usual morning working at St. Mary’s Hospital, took the train to Oxford, and despite a gusting wind at 15 miles per hour, decided he was ready for the assault on the sub-4-minute mile. With two hares, or rabbit runners, helping him, Bannister passed through the first three quarters in 57.5, 1:58.2, and 3:00.5. Before 1,200 spectators, the outstanding English runner finished the race in 3:59.4 to become the first human to run a mile in under 4 minutes. Later that year, Bannister convincingly trounced Australia’s John Landy in what was called a “miracle mile” at Vancouver, British Columbia, a sweet victory since Landy had permitted Bannister’s world record to stand for only 6 weeks before running a 3:57.9 in Paavo Nurmi’s home town of Turku. Landy was also interval trained, but he preferred to run 600-yard (.55 km) intervals in about 88 to 89 seconds each, a pace of about 59 seconds per quarter mile (.4 km). The Australian typically carried out 8 to 12 of these 600-yard runs per workout, with 4 minutes of slow jogging between each hard run. Landy was a true midnight rambler, doing most of his training around midnight after a hard day of studying. In addition to five interval workouts per week, Landy found time to hit about three weekly 7-mile (11 km) jaunts. A workout employed by the great miler and 1,500-meter runner Herb Elliott can also be productive for middle-distance runners. In this session, high-speed 1-minute bursts at close to top speed are alternated with 3 minutes of steady but moderate pacing for a total of about 44 minutes. This workout will develop greater speed and should also produce a heightened ability to run fast while tired—important for mile and 1,500-meter racing—without overly traumatizing the legs. The session promotes the development of a higher lactate-threshold velocity since sizable quantities of lactate are generated during the 1-minute accelerations and then taken up and used by the leg muscles during the corresponding 3-minute floats. This workout is similar to the lactate-stacker session (chapter 32) except that the slightly longer recoveries (3 minutes instead of 2) permit a faster running pace. Read more from Running Science by Owen Anderson.